Contact us today to schedule an appointment or to speak to one of our staff. We are more than happy to answer any of your questions with regards to our services. Located on level 1 within the Applecross Medical Centre at the intersection of Riseley Street and Canning Highway, there is plenty of parking available and lift access if required. Applecross Physiotherapy is a HICAPS provider and our services are covered by health insurance providers. 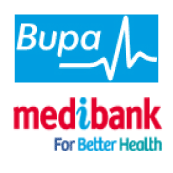 We are also a Medibank Members Choice and BUPA Preferred Provider. We accept GP referrals following Motor Vehicle Accident (MVA), Department of Veterans Affairs (DVA) and Enhanced Primary Care (Medicare EPC) Plans. Please feel free to contact for advice or an appointment via the Contact Form, directly via email or telephone. Clients regularly travel to us from all suburbs to undergo our experienced and friendly physiotherapy treatment & bike fit including Perth Metro, Perth CBD, East Perth, South Perth, Como, Mount Pleasant, Ardross, Booragoon, Manning, Salter Point, Rossmoyne, Myaree, Alfred Cove, Cottesloe and Bicton.